Adolescents with attention deficit hyperactivity disorder (ADHD) are at risk of academic problems, strained relationships, peer rejection, and unsafe behavior – and parents are often at a loss for how to handle these challenges. If Your Adolescent Has ADHD: An Essential Resource for Parents provides the latest information and accessible support that parents need. Contrary to former belief, ADHD that starts in childhood usually persists into the teens. The book, by Thomas J. Power, Ph.D., and Linda Wasmer Andrews, is one of the few to address the challenges of ADHD as it applies to teenage friendships, dating, curfews, and sports. Using the day-to-day experiences of real parents and the latest research, it offers guidance in treatments as well as relationships at home, school, and the community. The book includes evidence-based treatments for ADHD including behavioral therapy, medications, and educational interventions, along with practical advice on such issues as determining readiness to drive. “If Your Adolescent Has ADHD” is the latest in the Adolescent Mental Health Initiative series developed out of a joint endeavor between the Annenberg Public Policy Center (APPC) and the Annenberg Foundation Trust at Sunnylands. Launched in 2003, the initiative convened seven commissions that pooled their expertise on a range of adolescent mental health issues as well as positive youth development. 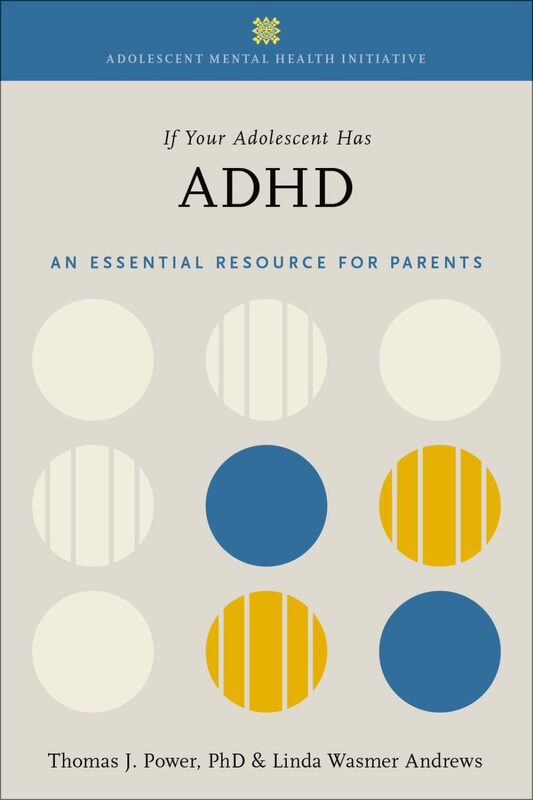 “This book for parents of teenagers with ADHD is a vital resource and a valuable addition to the series,” said Patrick E. Jamieson, the series editor and director of APPC’s Adolescent Health and Risk Communication Institute. Earlier books include four for parents in the “If Your Adolescent Has…” series, addressing parents of teens with anxiety disorders, eating disorders, schizophrenia, and depression or bipolar disorder. The series also has eight books written for adolescents, with first-hand accounts of teens’ experiences with bipolar disorder, depression, suicide, substance abuse, schizophrenia, obsessive-compulsive disorder, social anxiety disorder, and an eating disorder. The previously published books for teens and parents are available free as free, downloadable PDFs in English and Spanish at the Adolescent Mental Health Initiative. In 2017, Oxford University Press published the updated, second edition of Treating and Preventing Adolescent Mental Health Disorders, an extensive overview of the major mental health disorders that emerge during adolescence, which also developed from the work of the Adolescent Mental Health Initiative. This edition featured new sections on gambling and internet addiction and substantive updates to the acclaimed original volume published in 2005. Thomas J. Power, Ph.D., the lead author, is director of the Center for the Management of ADHD at Children’s Hospital of Philadelphia and professor of school psychology in pediatrics, psychiatry, and education at the University of Pennsylvania. His co-author, Linda Wasmer Andrews, is a journalist who has specialized in writing about mental health issues for more than three decades and co-authored six of the original books in the mental health series. “If Your Adolescent Has ADHD: An Essential Resource for Parents” | Oxford University Press | August 2018 | Paperback | $12.95 | 232 pages | ISBN: 9780190494636 | Publisher’s website. Download this news release here. Do adolescents have a natural tendency to engage in more risk-taking than children?